A/B Split Testing Minimum Sample Size: How Many is Enough? n is the minimum sample size required to prove that the two variants are statistically different. 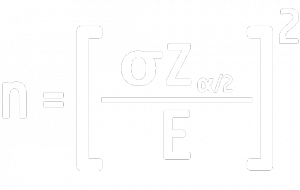 Z is the z-value corresponding to the chosen confidence interval in the Table of the Standard Normal Distribution. E is typically known as the “error.” In this application, E is the difference between the mean values of two samples. The Z-score that corresponds to 95% confidence is 1.64 (from the Table of the Standard Normal Distribution). In Excel, you can get the σ-value by using the function =NORM.S.INV(1-0.0756) which returns 1.435. Therefore. In this example you would need to make sure you have 4791 samples in order to prove that you have enough to make a statistically significant decision over which variant is better. As standard deviation increases (more variation in your conversion rate), you will need more samples. If you want more confidence (95% versus 90%), you will need more samples. As the difference in performance between the two variants becomes smaller, you will need more samples (it takes more data to make sure the difference isn’t just statistical noise). Easy right? Now get to work. Partner and co-founder at Vuurr; Scott’s our pay-per-click expert. He’s known specifically for pushing clients’ ROI ratios through the roof. Great post. I love that you’re actually getting to the math behind these statistical analysis algorithms we let run our marketing. That said, I think it’s helpful to consider the time frame of the test (in addition to the sample size). Several months is a long time to run a click-rate test. The longer you run a test, the more variables come into play that you have no control over (like real world events). And these variables will tend to change over time, further skewing results. A test run over the course of the next 3 months may have very different results than those run the months following that. If I understand correctly, you’re saying to start the test, get some results (so you can compare sample variance), and then run the formula to see how many more conversions you need before you declare your results significant. Seems like this methodology would leave you falling prey to “repeated significance testing errors”, as explained here: http://www.evanmiller.org/how-not-to-run-an-ab-test.html. The advice he gives in that article is to set your sample size before you start your test. Because if you just keep coming back to check on it, you will be skewing towards false positives in significance. Curious about your thoughts on that. Bob – That was a good article you linked to. I agree that you should have an idea of your sample size before you start, however, even to come up with a rough ballpark estimate, you would want to use the formula to make sure your predetermined sample quantity is enough to demonstrate significant results. You can’t begin to determine the required sample size without knowing the standard deviation of the data you are measuring. Without knowing this, you won’t know whether the data from the test variant is really different or just noise. You can use the page’s historical performance as a baseline. For the error (the difference between the baseline and the test measurement), you would want to use the difference between your baseline and your target output. The larger the difference you expect, the fewer samples you should need because a big change should stand out from the noise (which depends on the standard deviation). Is there some other step you’re taking I’m not aware of? You’re right, Jared. I just re-calculated and got the same thing. The post has been updated to reflect to new solution. Thanks for the feedback! No worries! I was just confused why my results looked so different than yours. Thanks for updating! Thanks for this great post Scott! It provides exactly what I was looking for. Just one clarification for me if you could please: The final answer 4,791 is the number of samples of the orange or the number of samples of the green and orange combined? Thanks so much! Scott, scratch the question above. I’m pretty sure the 4,791 is the sample size of the orange. Another question though: I’m running a test and for the control I have 5,738 visitors with 162 clicks (2.8%) and for the test I have 5,682 visitors with 183 clicks (3.2%). Thus far the different between control and test is not statistically significant. Using your formula I get a sample size of 600K in order to get statistical significance. Is there another formula that I could use that would tell me when to stop the test, irrespective of statistical significance or not? There is always the chance that I might be up to 600K visitors for the test and still not have statistical significance. Thanks again. Correct, the closer together the two results are, the more samples are going to be required to say that test is really better than control. This is because these aren’t just two data points, they are means that each have a standard deviation associated with them. So the problem is, when the means are close together and there is significant data in each data set, it is difficult to tell the difference between a statistically high, but normal, value from the control group and a statistically low, but normal, value from the test group. In a scenario like this, control and test are statistically no different. My advice would be to alter the test to either generate a larger difference in the means or reduce variation. Either of these will diminish the number of samples required to produce a statistically significant result. I wonder how to find statistical significance in case of conversion rate(many per click). The total conversions that one click associates may be totally different every time. Is the statistical significance of conversion(one per click) enough to draw conclusion for the corresponding many per click too? You can use the same formula for conversion rate (many per click). The conversion rates of your samples would be expressed as decimals and would have a mean value and standard deviation like any other numeric data. Yes, as you said, there is no problem in implementing the formula. But, say that button A displays 20 products (max 20 conversions) and button B displays only 2 products (max 2 conversions). Say that, from the above calculation, I gathered required data and got result that button B yielded more conversions. But one can easily argue that the result is not because button B was attractive, but just because it contains more product (May be this condition contradicts the idea of A/B test). But I am trying to find out a method to show statistical significance in such a case that the two buttons lead to different number of products. I would probably choose a different metric like total revenue that would be a better apples-to-apples comparison. I follow you through the whole methodology, but I cannot understand if the final sample size refers to the whole bucket (orange + green try visitors), one of them (orange visitors) or clicks sizes (orange + green clicks?). What is 4791 referring to? 4791 would refer to the total number of samples, so in this case, the total number of visitors exposed to the experiment. Scott Yacko is a partner and co-founder at Vuurr. Among his executive duties, he posts himself as Vuurr’s pay-per-click expert by pushing his clients’ ROI ratios through the roof. Outside Vuurr, Scott’s usually running outdoors, traveling with his wife and playing with his dogs.